A cult name among NWOBHM diehards, ROBESPIERRE were actually active during the original NWOBHM movement, recording two demos in 1983 that remained unreleased or circulated only among close contacts. Those two demos were released in 2011 as the Die You Heathen, Die! compilation, introducing the Liverpool band to a whole new generation lusting for vintage heavy metal sounds. 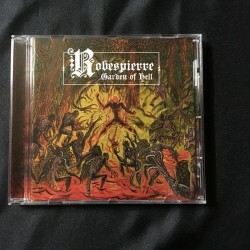 However, ROBESPIERRE never recorded a proper debut album - until now! Indeed sounding like nearly four decades haven't passed, Garden of Hell brims with that musky 'n' musty scent of classic NWOBHM: traditional and totally METAL songwriting, with hooks piled high and no small amount of grit. 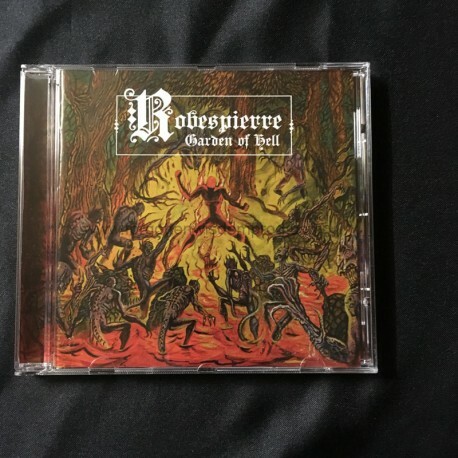 And like a few of their original NWOBHM contemporaries, ROBESPIERRE are keen on dipping into doom - like, really DOOMED-OUT doom that plods like tombstones slowly falling over and enveloping the listener in an ancient haze. Similarly, the band's forward momentum is brisk but never too aggressive, in exchange exuding a rare sense of class and allowing the subtle textures of their endless hooks to sparkle in the night. Above all, Garden of Hell is aptly titled: for all the raucous rockin' going on, there's an ever-present atmosphere of supernatural horror dusting nearly every note.